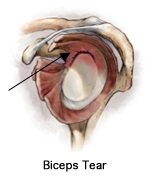 A Bicep tendon Tear can occur from lifting heavy objects, falling on an outstretched arm or playing contact sports. The bicep tendon attaches the biceps muscles to the shoulder, providing leverage for lower arm movement. A bicep tendon rupture occurs when the tendon attachment separates from the bone. After this happens the muscle cannot pull on the bone and certain movements may seem weak and painful. Symptoms include pain, swelling and certain muscle movements may seem weak. A distal bicep tendon rupture is characterized by sharp pain over the front of the elbow. Swelling and bruising around the elbow are also symptoms. A proximal rupture usually isn’t as painful.